The ultimate medical guide for travelers and athletes, also covering work-related accidents and major disasters. This book is by far the most elaborate and successful guide to homeopathic first aid and is available in several languages. Manuel Mateu-Ratera, a highly regarded homeopath and specialist in emergency medicine, shares with us the fruits of his many years of clinical study and practice. First Aid with Homeopathy is aimed at both health professionals and people who wish to improve their skills in first aid. It describes most of the accidents which we can encounter in our daily life – at home, at work, practicing sports – as well as in serious emergencies, in extreme sports or in natural catastrophes, with their accompanying homeopathic treatment. 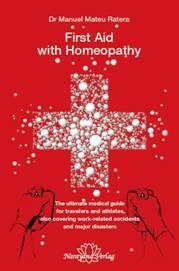 Many situations which are not described in other homeopathic first aid books make this book unique, such as deep-sea diving trauma and mountaineering accidents. The author presents both the allopathic and homeopathic approach, and Chinese pressure points which can give immediate relief in many emergency situations. It is a great resource to have at home as well as an ideal travel companion. It covers many situations found on overseas travels, including food poisoning and various bites and stings. It is also condensed enough to take up a limited space in a suitcase or backpack. It is of inestimable use in any medical practice. An exhaustive Materia Medica describes about 200 remedies. Not sure whether homeopathy works for you? Copyright © 2019 Homeopathy Wiltshire. Powered by WordPress. Theme: Accelerate by ThemeGrill.